The other day my mum posted a photo to her facebook page, a normal photo she took a few months ago whilst on a day trip to the canal, where her and my Dad spend most of their free time on board their boat. After posting this photo, a friend in America commented that like with clouds, where you sometimes can make pictures from the random shapes, she could see a definite man in the ripples of the water. Isn't it funny how faces are the first thing our human minds sees in random swirls and patters, the name for it is matrixing, and its a really interesting process, maybe its because we naturally look for a friendly face, as we need other humans to survive, or maybe its mother nature herself showing us something we other wise wouldn't see... you see this photo was indeed just a picture of the ducks, but when you see a man in the water this picture could mean so much more. 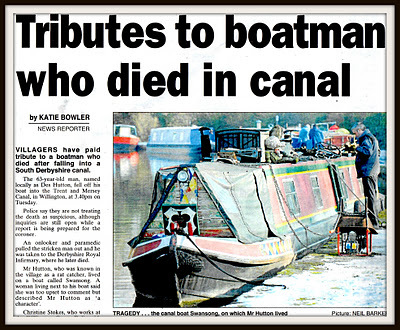 3 years ago today, 3rd February 2009 there was a tragic accident on this very stretch of canal, a canal boat owner, a lovable rogue, who lived alone on his narrow boat whilst swapping his gas canister accidentally slipped and fell into the freezing water. He sadly lost his life. 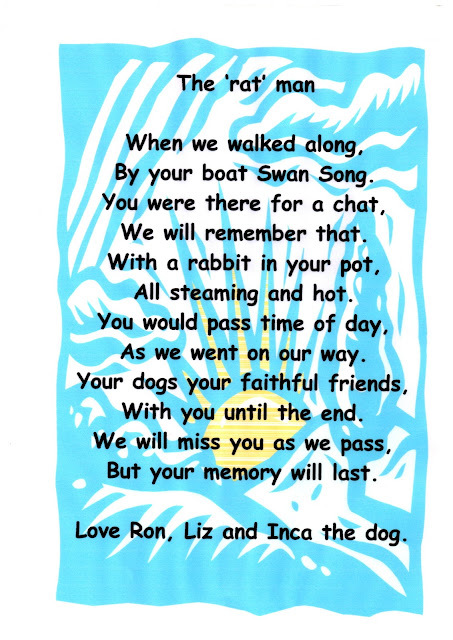 This story touched my parents hearts, they have made friends with other boat owners over the years and enjoy the calm life the canal brings. 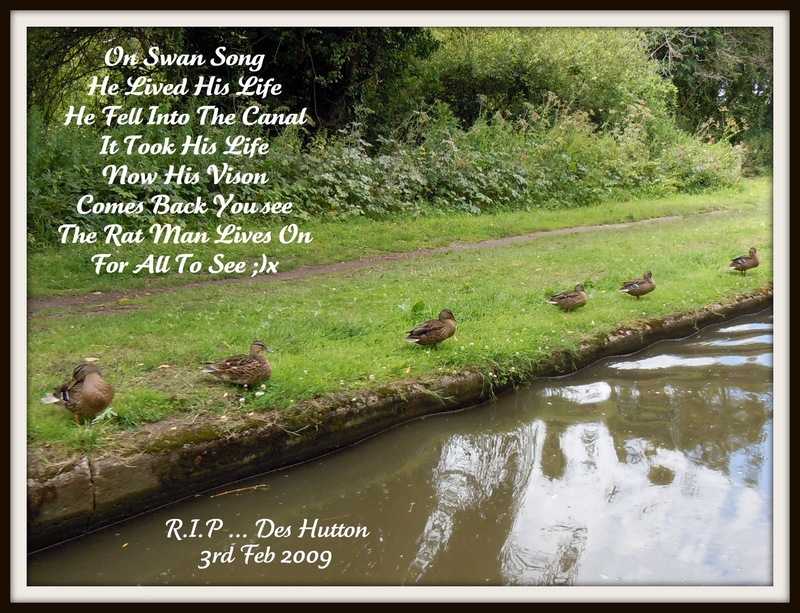 They used to wave and say hell to Des so when they heard of this accident my mum wrote a poem for 'the rat man' as they knew him. 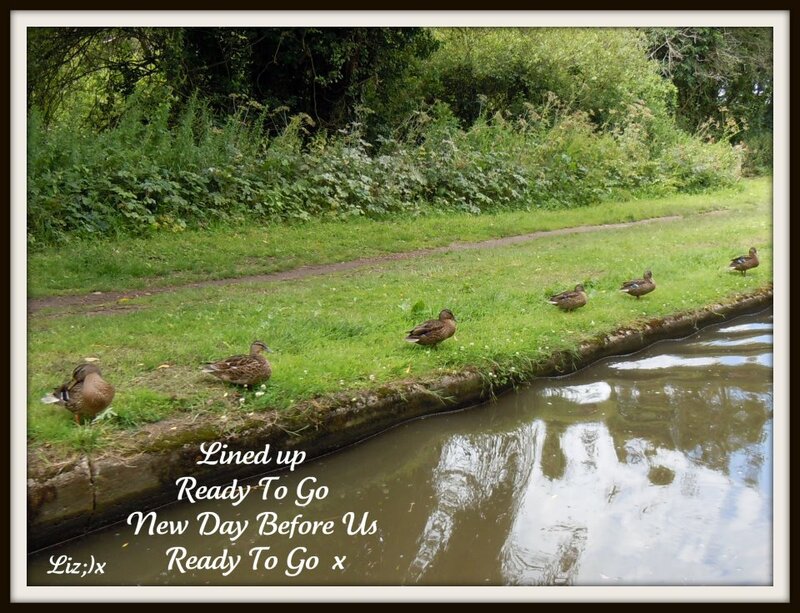 The years have passed and the memory of that day left at the back of every ones minds, life continues as it does, but this photo made us think again of that tragic day. What made my Mum post that photo to facebook just the other day, we do not know, why the water does indeed make such a clear picture in the swirls is a mystery. Maybe its just our minds doing clever things,or perhaps it really is natures way and deeper signs and meanings are there. Whatever the reason may be we look at this photo in a different light now and today we remember a man whos memory lives on. I also used to chat with him and he was a great character. Beautiful. I'm going to keep looking at the water. What a sad story; I know of others lost in the Cut, particularly a four year old boy.